How did the Age of Exploration change the way Europeans viewed the world? After Columbus’s voyages, Spain was eager to claim even more lands in the New World. To explore and conquer "New Spain," the Spanish turned to adventurers called conquistadors, or conquerors. The conquistadors were allowed to establish settlements and seize the wealth of natives. In return, the Spanish government claimed some of the treasures they found. Key Explorers In 1519, Spanish explorer Hernán Cortés (er–NAHN koor–TEZ), with and a band of fellow conquistadors, set out to explore present-day Mexico. Native people in Mexico told Cortés about the Aztecs. The Aztecs had built a large and wealthy empire in Mexico. With the help of a native woman named Malinche (mah–LIN–chay), Cortés and his men reached the Aztec capital, Tenochtitlán (tay–nawh–tee–TLAHN). 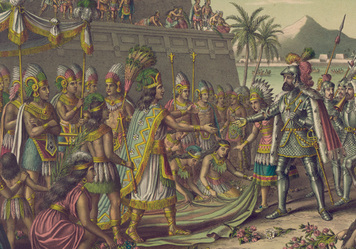 The Aztec ruler, Moctezuma II, welcomed the Spanish with great honors. Determined to break the power of the Aztecs, Cortés took Moctezuma hostage. Cortés now controlled the Aztec capital. In 1520, he left the city of Tenochtitlán to battle a rival Spanish force. While he was away, a group of conquistadors attacked the Aztecs in the middle of a religious celebration. In response, the Aztecs rose up against the Spanish. The soldiers had to fight their way out of the city. Many of them were killed during the escape. The following year, Cortés mounted a siege of the city, aided by thousands of native allies who resented Aztec rule. The Aztecs ran out of food and water, yet they fought desperately. After several months, the Spanish captured the Aztec leader, and Aztec resistance collapsed. The city was in ruins. The mighty Aztec Empire was no more. Four factors contributed to the defeat of the Aztec Empire. First, Aztec legend had predicted the arrival of a white-skinned god. When Cortés appeared, the Aztecs welcomed him because they thought he might be this god, Quetzalcoatl. Second, Cortés was able to make allies of the Aztecs’ enemies. Third, their horses, armor, and superior weapons gave the Spanish an advantage in battle. Fourth, the Spanish carried diseases that caused deadly epidemics among the Aztecs. Aztec riches inspired Spanish conquistadors to continue their search for gold. In the 1520s, Francisco Pizarro received permission from Spain to conquer the Inca Empire in South America. The Incas ruled an empire that extended throughout most of the Andes Mountains. By the time Pizarro arrived, however, a civil war had weakened that empire. In April 1532, the Incan emperor, Atahualpa (ah–tuh–WAHL–puh), greeted the Spanish as guests. Following Cortés’s example, Pizarro launched a surprise attack and kidnapped the emperor. Although the Incas paid a roomful of gold and silver in ransom, the Spanish killed Atahualpa. Without their leader, the Inca Empire quickly fell apart. The Impact of Later Spanish Exploration and Conquest The explorations and conquests of the conquistadors transformed Spain. The Spanish rapidly expanded foreign trade and overseas colonization. For a time, wealth from the Americas made Spain one of the world’s richest and most powerful countries. Besides gold and silver, ships from the Americas brought corn and potatoes to Spain. These crops grew well in Europe. The increased food supply helped spur a population boom. Conquistadors also introduced Europeans to new luxury items, such as chocolate. In the long run, however, gold and silver from the Americas hurt Spain’s economy. Inflation, or an increase in the supply of money, led to a loss of its value. It now cost people a great deal more to buy goods with the devalued money. Additionally, monarchs and the wealthy spent their riches on luxuries, instead of building Spain’s industries. The Spanish conquests had a major impact on the New World. The Spanish introduced new animals to the Americas, such as horses, cattle, sheep, and pigs. But they destroyed two advanced civilizations. The Aztecs and Incas lost much of their culture along with their wealth. Many became laborers for the Spanish. Millions died from disease. In Mexico, for example, there were about twenty-five million native people in 1519. By 1605, this number had dwindled to one million. List the various effects of later Spanish exploration. Your list should include at least five different effects. An example is done for you.